Can New People Navigate Your Worship? You are at:Home»Leading Ideas»Can New People Navigate Your Worship? Many churches have a way of doing things that doesn’t allow for new people to connect. Without even knowing it, we exclude those we truly want to reach. Let me illustrate. A guest arrives at a church that is new to her. She learned of the service times from the website. She is nervous. She almost talked herself out of coming five times. But something drew her to worship. She easily finds a parking place but isn’t quite clear where to enter the building. She follows another family in a door, and is greeted quickly by someone who hands her a folded piece of paper. She realizes quickly that she is early, really early. Later she will learn that the church had changed service times but neglected to make the change on the website. Everybody else arrives on time. But for the church to adapt in a way that leads to life for more people, we must care enough to open the closed loop to let new people in. We must be willing to think about everything we do in worship through the eyes of the newcomer. The first thing that happens in worship is the sharing of announcements. A lot of announcements. Sounds like a lot is going on, but it is hard for her to decipher what all the events are. The letters VBS mean nothing to her. She wonders why a rummage sale would be so important to a church. The next thing the person speaking (no idea who the person is) does is invite people to stand and “pass the peace.” She stands, but doesn’t know what to pass. A couple of kind people come and shake her hand, but then move on to someone else. She stands awkwardly as she hears others talking with their friends. They then sing a song. She realizes the numbers in the folded program refer to a number in the book in the pew. She stands to sing and feels some comfort as she hears the sounds of voices mixing together in song. After the song, another unidentified individual asks for “joys and concerns.” People begin sharing requests for prayer. She doesn’t know any of the folks being discussed, but everyone else seems to as they nod with knowing looks as each prayer request is lifted up and updated. I’ll stop there. Many worship services have created a closed loop that is very hard to break through. Some persistent ones hang in there and eventually understand the lingo and the patterns. But for the church to adapt in a way that leads to life for more people, we must care enough to open the closed loop to let new people in. We must be willing to think about everything we do in worship through the eyes of the newcomer. It may mean giving up the passing of the peace because we realize this is not a time when guests feel more welcomed, but more isolated. It may mean finding other arenas where prayer requests can be shared and actually prayed over. It may mean sharing fewer announcements in worship and spending more time focusing on connecting people to God. In short, opening the closed loop demands intentionality. Intentionality starts in preparation. Preparation for worship should take into mind what we know about our community. The question of intention is “why?” Why are we singing this song? Why are we having a children’s moment? Why are we making seven announcements? People who come for the first time and those who are returning for their 100th time appreciate the decisions made to include everyone in the worship of God. They may never notice it, but they will feel it. And they will return. This article is adapted from Jacob’s new book, The New Adapters: Shaping Ideas to Fit Your Congregation, published and used with permission by Abingdon Press, and available at Cokesbury and Amazon. Jacob Armstrong is the founding pastor of Providence United Methodist Church in Mt. Juliet, Tennessee. What Next Faithful Step is God Calling Your Church to Take? 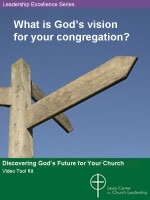 Discovering God’s Future for Your Church is a new turn-key tool kit to help your congregation discern and implement God’s vision for its future. The resource guides your church in discovering clues to your vision in your history and culture, your current congregational strengths and weaknesses, and the needs of your surrounding community. The tool kit features videos, leader’s guides, discussion exercises, planning tools, handouts, diagrams, worksheets, and more. Learn more and watch an introductory video now.